Jerry Cornelius doesn't just to to work every day; he gets up and works on his dream. The owner of Canyon Creek Art and Frame has spent the last 23 years framing art, but it wasn't until the opening of his shop at 2100 Alamo four years ago that his dream truly came to fruition. "I had never tried anything artistic in my life, but I was going to Richland Community College, and needed a part-time job," he says, "I got a job for a store named U-Frame-It. It was the first time I had tried anything artistic, but it sounded like something that might be a lot of fun." He had no way of knowing that his part-time job would be the thing that changed the direction of his life. "Everyone has one thing that they can do well, and for me, I knew immediately that picture framing was it. It became evident, even to the people who worked there, that this was just something I could do naturally." For the next two decades, Cornelius would do whatever it took to keep his dream alive. The path was filled with detours and roadblocks, but he refused to give up hope. Shortly after he launched his career, his father suffered a stroke and he returned to his hometown of Lawton, OK., to help care for him. 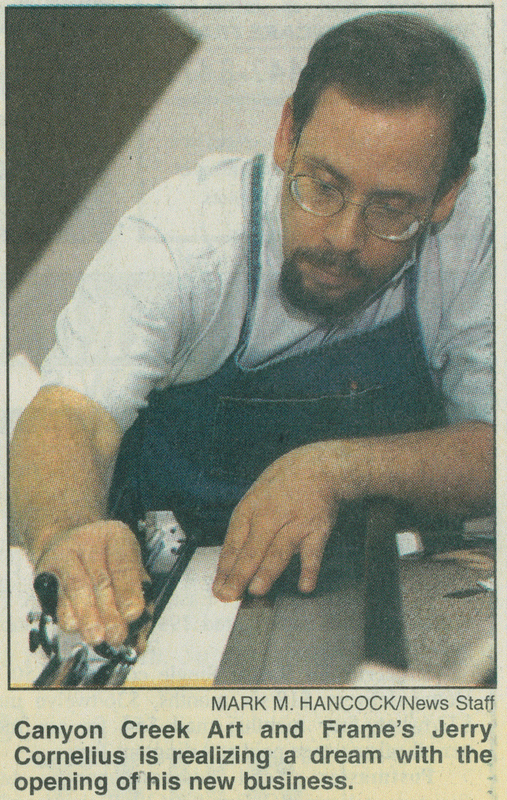 Upon returning to the Metroplex, one year later, he became a junior partner with Frame Makers, and after two years he moved to San Marcos, where he ran San Marcos Frame Company for five years. "I came back to Dallas and had a lot going on in my life," he says. "I didn't frame for a while, and I really missed it. After about nine months, I was working as an individual consultant and did a lot of commercial work. But it really wasn't the same." To pacify his passion for framing, Mr. Cornelius maintained a shop in his garage, running his own side business regardless of what he did for the 9-to-5 grind. Finally, with the encouragement and support of his wife, Barbara, he decided to pull out all the stops and open the shop of his dream. Canyon Creek Art and Frame is a 2,000-square-foot gallery offering all custom framing and museum-quality work. In the four years since it opened, business has taken off. "There's so much more to this that people don't always realize," he says. "You have to use the right glass so the artwork won't fade. We used museum mounts so the artwork stays fresh. A lot of people think you can just slap a frame on a piece of artwork, but there's a lot more to it." As a member of the professional organization, Professional Picture Framers Association, Cornelius takes ongoing education classes to always improve upon his craft. The certified picture framer admits that hi skill comes at a price, but it lasts forever. "We really do emphasize value. We're not the cheapest, but we are the best. And when people come in with heirloom items or fine art that needs a frame, you don't want to cut corners. A bad frame job can ruin the quality of the art." Fewer than 10 percent of the picture frames in business today are certified framers, which is why he often gets customers who have tried less expensive framers with disappointing results. He says part of the joy of his job is to be able to give the customer something beyond what their mind's eye envisioned. "The most fun I have is when I design something for someone, and I know in my mind what it will look lie, but they can't really see it the way I do," he says. "The best thing in the world is seeing the joy and the excitement on their face when they see it for the first time. I get a lot of that, and it is just so cool. It is such a great reward." That reward became even greater last year, when readers of the Dallas Observer voted Canyon Creek Art and Frame the best frame shop in the Metroplex. Cornelius admits that his success is a blend of skill, fate and timing. "I entered this business at a great time, because I learned most of what I know from old framing masters," he explains. "At the time, I was there when the technical expertise began evolving. So now I have these old-school-ways of looking at framing, along with this state-of-the-art equipment that allows for unbelievable precision. Sometimes I'm even surprised at what can be done now." Most recently, Canyon Creek Art and Frame began selling artwork by Texas artists, and the shop has added a virtual gallery online. All things considered, Cornelius couldn't have planned it better himself. His amazement is genuine and his appreciation for his lot in life is obvious as he surveys the thriving frame shop. "I am one of the lucky ones in life," he says. "There is noting I could want that I don't have. There is nothing I can do in life that I would enjoy more. I can see doing this for the rest of my life."